Vitamin C and Vitamin B3 are readily used ingredients in anti-aging remedies and creams, antioxidants and restorers. Independently they have many benefits for our skin, helping it to stay and look healthy whilst also preventing the signs of aging. But just how effective are they? Also, can they be used together in the same product or will they have a negative effect on the skin? Does this mean we will have to settle for using only one of these at a time? After some research into Vitamin C (ascorbic acid) and Vitamin B3 (Niacinamide) being used together suggested they were incompatible, questions arose. However further refuted studies, in fact, confirming the opposite findings. So is the incompatibility of Vitamin C and Vitamin B3 used together in the same cosmetic beauty product, myth or reality? Luckily it is just a MYTH. However to find the truth firstly we have to go back to the first studies which were done in the 60s. Some scientists concluded that using the two vitamins combined on subjects was lacking in effectiveness. What's more, together they could produce a substance called nicotinic acid causing skin redness which was discouraging and implied that you should not mix these two vitamins in the same cream. The findings were a result of the conditions. Vitamin B3 needs an almost neutral pH to be stable whilst on the contrary, vitamin C needs a lower pH to be stable, that is an acidic pH. When combined at high temperatures, the vitamins would react giving rise to this nicotinic acid which is harmful to our skin. Therefore the conclusion was that is was advised against combining these vitamins together. Whilst the study is true in its findings, the vitamins are incompatible when exposed to specifically high temperatures, like all myths, this general supposed incompatibility of the vitamins is only part of the truth. Actually what occurs under normal conditions, which even includes leaving a beauty product in direct sunlight in summer, is a non reaction; they can be safely mixed together as nothing occurs nor changes. However, we do need to consider the veracity of study in its discovery of the different pH needs for the stability of the vitamins; they require different conditions of pH in order to remain in their perfect stable states. This would suggest that they need to be stored separately because if they need different pH’s, it would be problematic to preserve them together in the same formula as sharing a communal pH would mean that the active ingredient would be poorly preserved. The result would be a degraded version of the active vitamin; losing its very properties, function, and effectiveness. 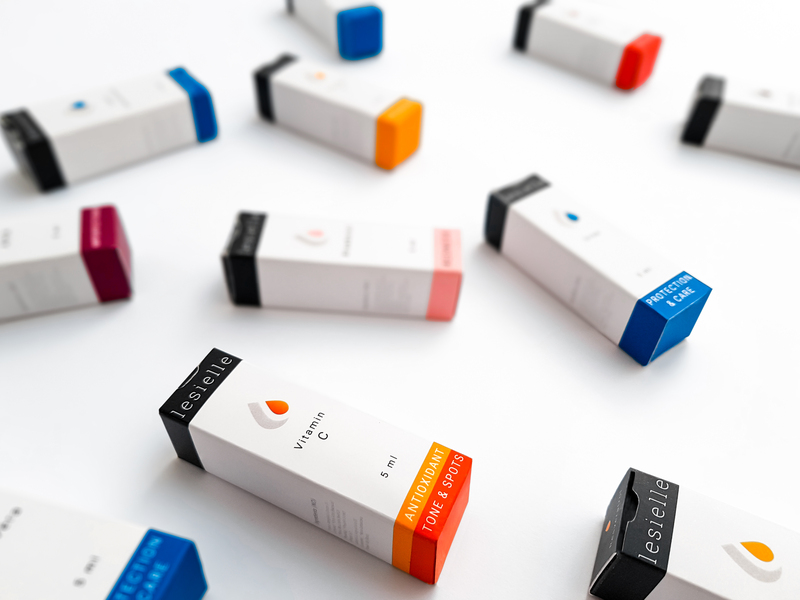 So as you can see this last challenge of storing the active ingredients in their ideal pH’s and environments is one of the reasons that led us to create Lesielle. As you know our active ingredients are always separated (isolated formulation). Each in its ideal medium so there are no implications of reactions, pH incompatibilities, as the ingredients are only mixed at the moment prior to application. The isolated formulation thus maintains all its properties intact, each one preserved with its respective pH and without the possibility of degrading when mixed. What’s more, is our containers are opaque and airless, a technique that maintains the intact properties of the ingredients which ensure the effectiveness of these two vitamins in your personalized beauty cream. Both Vitamin C and Vitamin B3 have magnificent qualities for the care and protection of our skin. They are considered to be the most effective beauty cosmetic ingredients, especially vitamin B3, which is compatible even with the most sensitive of skins. That's why right from the off at Lesielle we decided to work with both to offer a personalized product that adapts to all cutaneous needs. Vitamin C, in the form of ascorbic acid or in some of its stabilized forms (such as magnesium ascorbyl phosphate), is a great antioxidant that protects us from pollution in large cities, avoids unwanted shine yet illuminates the face like no other active ingredient or treatment. In addition, used topically its effect is evident, provides us with that care that our skin needs and visibly giving a bright glowing tone. Vitamin B3 or Niacinamide has a restorative quality that corrects dilated pores, fine lines and cares for opaque and dull skin. It stimulates our skin to produce ceramides and other lipids improving the barrier function in our skin, fighting against external factors and maintaining good hydration. So now that we have dismantled the myth we can say that vitamins C and B3, are far from being incompatible, and on the contrary when these vitamins are combined they can be very effective in a daily skincare routine. Vitamin C and B3 care for normal, oily, dry and mixed skin types whilst also working as an anti-aging effect, antioxidant and the elimination of skin tone and spots. 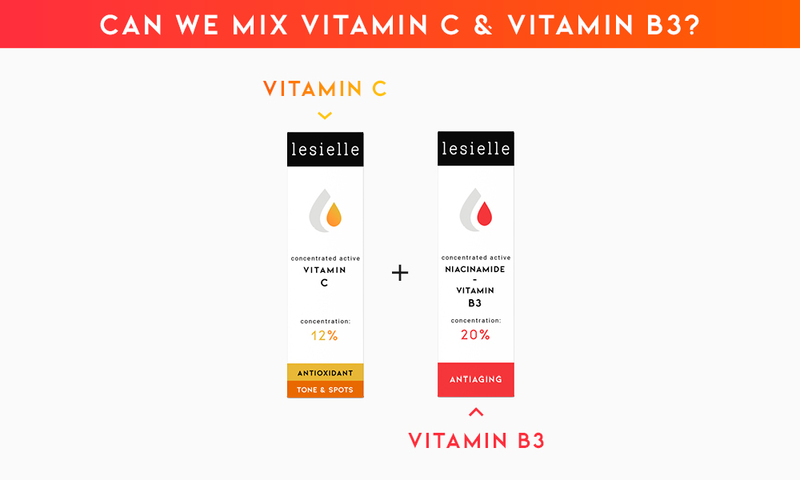 In Lesielle you can always choose the ingredients that best suit your skin in order to keep it healthy. So add Vitamin C and Vitamin B3 to your base cream. You can have antioxidant and restorative care for your skin in the same product. Don’t hesitate to try, you'll be surprised by visible results in just a few weeks.